I have heard from people around saying that they hate kale. Some have never tried it. But I love kale! Previously, our blog talked about the queen of vegetables . 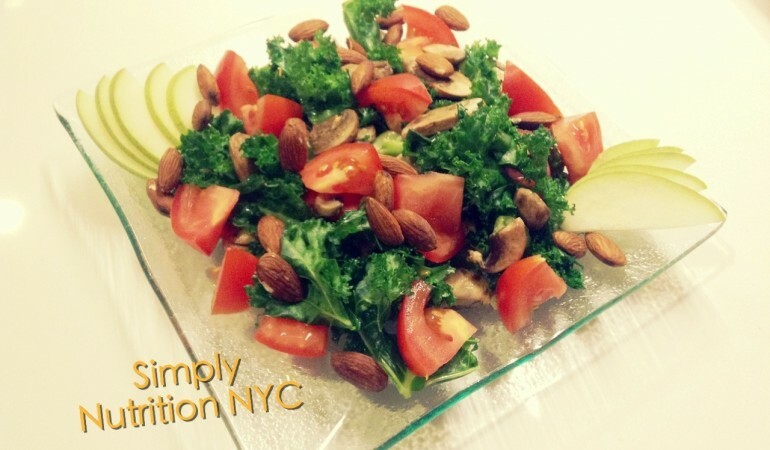 This warm kale salad idea was inspired by a kale salad I had from Northern Spy Food Co., one of my favorite restaurants in NYC. Raw kale can taste rough and grassy, while kale softens, appears bright green and absorbs flavor better when just sautéed slightly. This recipe makes kale tastes and looks better as well as maintains the nutrition value of kale. If you have never eaten kale, try it today! Study has shown that it could take up to 20 trials to get used to a new habit, which applies to trying a new food too. Kale might be your new favorite veggie! 1. Heat olive oil in a sauté pan. Stir in kale and sauté for 2 minutes. 2. Add mushroom, sesame oil and seasonings. Cook for 1 minute. Set aside. 3. Remove moisture from pan with paper towel. Toss almonds in heated pan for 1 minute. 4. In a salad bowl, toss together sautéed veggies, tomato wedges, toasted almonds and pear slices. This salad is great to be served as side veggies, or a light meal.